A month ago I successfully ported Tizen:Common to the open source hardware development board Radxa Rock with Rockchip RK3188 ARM SoC. Back then I started the open-source project tizen-rockchip at GitHub. 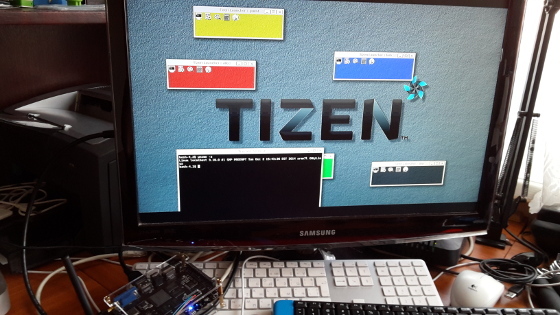 The purpose of the project is to port Tizen into various devices with Rockchip ARM SoC. Tizen is a Linux-based open-source software platform for all device areas with support of HTML5 application development. Tizen 3 is divided into different profiles depending on the profile of the targeted devices: mobile, wearable, IVI (In-Vehicle Infotainment), etc. All these profiles have a same base - Tizen:Common. Firefly-RK3288 is the second device with Rockchip SoC on which I ported Tizen:Common. This device has Rockchip RK3288 quad-core Cortex-A17 ARM SoC with Mali GPU. The board also has 2GB dual-channel DDR3 RAM and 16GB internal memory. Firefly-RK3288 has both HDMI and VGA ports, 2 USB hosts, an Ethernet port, infrared, Bluetooth 4.0 and a WiFi. Personal computer (preferably with a Ubuntu or alternatively with Linux distribution or Mac OS X). Download the bundle for creating bootable microSD cards provided by Linuxium and unzip it. Use micro USB OTG cable to connect Firefly-RK3288 to the personal computer. Press and hold RECOVERY hardware button. After that shortly press RESET hardware button and after two seconds release RECOVERY. Download Tizen:Common image for Firefly-RK3288. Plug the microSD card into your personal computer. Eject the microSD card from the personal computer. Plug the prepared microSD card into Firefly-RK3288 and turn on the board. You can log in as root with password tizen. Running Android or Linux from an SD card on a RK3288 device - An easy way to dual boot.